USA’s Nathan Chen performs his free skate at the 2017 Four Continents Figure Skating Championships. 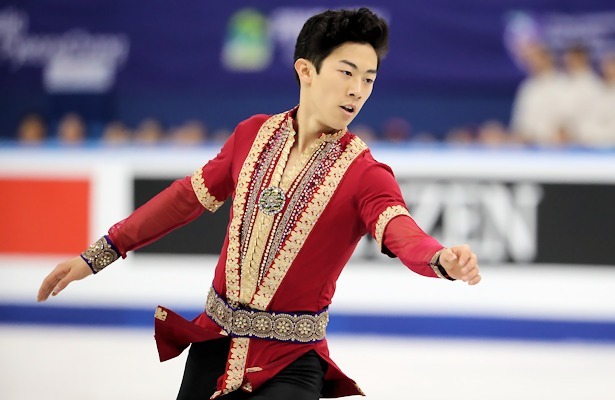 If anyone had a doubt of who the new quad king is, they know it now: USA’s Nathan Chan won his first championship title at the 2017 ISU Four Continents Championships on Sunday landing a total of seven quads en route. Olympic champion Yuzuru Hanyu of Japan settled for the silver medal and the bronze went to his teammate Shoma Uno. Chen skated to the lead with a clean short that included a quad Lutz-triple toe, quad flip and triple Axel. In the long to “Polovtsian Dances,” the ISU Grand Prix Final silver medalist actually did more quads than triples: five quads as opposed to three triples. He opened with a big quad Lutz-triple toe and a triple flip, followed by a somewhat shaky quad toe and quad toe-double toe and a quad Salchow. The two triple Axels weren’t perfect, but the triple Lutz was fine. Chen also collected all level fours for his spins and footwork to score 204.34 points, a personal best. With a total of 307.46 points, he was able to maintain first overall. Two mistakes cost Hanyu the championship. In the short program he popped his planned quad Salchow into a double, but he did at least a triple toe for a combination with it and he also hit the quad loop. The Japanese superstar trailed Chen by 6.08 points heading into the long. Hanyu then came out and delivered an excellent performance to “Hope and Legacy” by Joe Hisaishi, reeling off four quads (including the loop) and three triples (including two Axels), but he again doubled a Salchow. Nevertheless, the 2014 World champion was first in the free skating and had another big score of 303.71 points overall. The 22-year-old impressed once again with the ease with which he moves across the ice and his effortless jumps. Uno has joined the “quad craze” (as quoted by Nathan Chen) by adding first the quad flip to his programs and now the quad loop. He landed both and two quad toes (one was shaky), but he fell on both triple Axels. In the short, the quad flip could have been better. He dropped from second to third at 288.05 points. Canada’s Patrick Chan, who had won the title a year ago with a spectacular free skating, finished fourth. The short was subpar with a fall on an underrotated quad toe and a stumble on the triple Lutz-triple toe. Chan felt like the timing was off for the quad. The opening of his exquisite long program to “A Journey” was strong with a quad-triple toe and triple Axel, but then the three-time World champion went down on the quad Salchow and also missed the second quad toe. Boyang Jin of China struggled with some jumps as well to place fifth. He also fell on the quad loop that he attempted for the first time in an international event. USA’s Jason Brown missed the triple Axel in the short and stood in ninth place, but pulled up to sixth with a good free skate that included six clean triples. The national bronze medalist, who had been injured, decided to take the quad out. Uzbekistan’s Misha Ge, another crowd favorite, also opted for clean performances and did not try a quad.